A protest against climate change and the M74 road extension, which caused chaos in Glasgow, has ended. Around 300 people took part in the rally on the George V bridge over the River Clyde and all have now left. The anti-G8 group Dissent organised the Boogie on the Bridge event as part of action against climate change and construction of the new road. 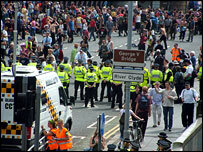 Sixteen people were arrested as police tried to disperse the protesters from the city centre during the day. 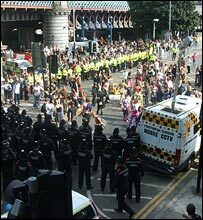 Officers flanked the demonstrators, some of whom were dressed as clowns, as they marched to the bridge after gathering in the east end of the city at about 1300 BST. Vanessa Head, 22, from Sussex, said: "I think it is important that people come and show that they care about issues like climate change. "I think a lot of the time the world leaders put us all under one umbrella but we need to show that the whole of the world is behind doing something to stop climate change. "It is important that they see a presence like this." One protester, who gave her name as Mary, said: "We are protesting against oil dependency and the building of new roads so that more cars can burn more fuel and destroy the climate." The efforts to create a party atmosphere were aided by jugglers and a sound system which was wheeled along in a shopping trolley, as well as the arrival of the Clandestine Insurgent Rebel Clown Army - a fixture at many of the week's anti-G8 protests - on bikes. Earlier, the Kingston Bridge ramp at Waterloo Street was shut and is likely to remain closed throughout Friday. Police foot and vehicle patrols were placed on both sides of the bridge but have now said that traffic is moving freely over the span. A police spokesman said: "We have robust contingency plans for the roads, however, if some disruption does occur, we would urge motorists to be patient and follow diversion routes." A statement from Dissent called for people to join them on the streets and protest for a "just, joyous, fossil-fuel free future". It said: "We are here to make some noise: to shout our rage and dance our hope; to stand up and show the G8 and the world that the climate crisis can no longer be ignored." Dissent said that the climate crisis had been created by the G8 and "international institutions, power-hungry politicians and profit-seeking companies that constantly put the needs of people and the environment last". Plans to extend the M74 in Glasgow so that it joins the M8 in the city centre were also condemned by the group. It said: "Local people have rejected the extension, knowing that it would increase air and noise pollution, contribute to climate change, worsen traffic and split their local community. "But the government planners, bent on pursuing the false needs of 'progress' and 'economic development', plough ahead with their road building schemes." Minor G8 demonstrations continued in Edinburgh with small-scale protests around the city centre. Lothian and Borders police said very little disruption was caused but they were maintaining a high security profile in the capital. About a dozen people were sitting outside the city's sheriff court where people appeared in connection with disturbances earlier this week. Meanwhile, about 100 people calling for regime change in Iran staged a colourful protest at the foot of The Mound. A large banner reading: "G8 Kills" was unfurled on Salisbury Crags, overlooking the Scottish Parliament.